4 Paths To Wellness – Your health is your greatest wealth! We are on a personal mission to help people transform their lives. We were on the award winning Dr. Joy TV show, ‘Your Prescription For Total Wellness’! Send us your thoughts here. We are proud to be Influencers of the Wellness Universe! This is a fantastic place where you can gain a lot of insight on everything wellness. We are happy that we have been chosen to be Sponsored Athletes for Unchained Muscle, a UK based online fitness clothing store that gives 20% of their proceeds to a Mental Health organization. They offer *free* shipping anywhere around the world! Go to Unchained Muscle, select your region, then when you have the item(s) you would like to order, click on the button that says, ‘Click here if you have a Discount Code’ and follow the instructions to list all your items and then you will receive an email to pay via PayPal your discounted price. As a teenager I’d always been skinny, but some time around my mid 20’s my weight began to grow. By 2008 I was my heaviest weight. 214 lbs. I was diagnosed a type 2 diabetic in August 2008. My fasting sugar was 300. I was put on Metformin. I battled my disease for several years. In Spring of 2015 I decided enough was enough. I didn’t want to take any medication. I wanted to be healthy. I started counting calories using an app. And I started walking daily. Walking led to running. My weight dropped fairly quickly and within a couple of months I was able to stop taking Metformin. I’ve been drug free for nearly 4 years now; I have lost a total of 70 lbs and I’m maintaining my weight loss and my fasting sugar numbers are averaging in the 70’s to low 80’s. I’ve turned my health around and my passion now is to help others do the same! 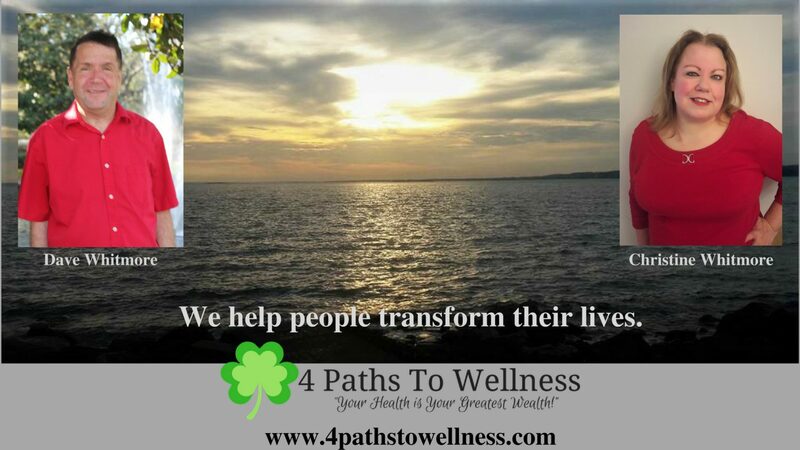 You can follow me on Twitter @4paths2wellness. You can also email me at dave@4pathstowellness.com. We moved to central NJ in September 2016 from Staten Island, NY and we love it here! My formal background is I have an A.S. in Biology and B.S. in Health Services Administration. I worked in the healthcare field as an Accounts Receivable Manager for 16 years. Once I realized that I would always work for the other person unless I did something about it, I looked for ways to put my passion into helping others. My passion in life is helping others. I love children and animals and try to find ways to help in stopping their abuse that sadly goes on today. Since I know the pain of infertility, I am on a mission to help other women who are going through this or have gone through it. I am a vegetarian for over 25 years and try my hardest to eat vegan at home. It is because of my love for animals that I became a vegetarian. I like to read, dance and be silly at times and spend time meeting other like-minded people. I am married to my best friend, Dave, for 13 1/2 years. I have great faith and thank God for all His blessings. My husband, Dave, inspired me to finally do something about my weight and stick with it. He is a type 2 diabetic and was on Metformin, when the doctor wanted to added another medication that would have destroyed his liver. He had enough and finally starting to do something about it. He joined My Fitness Pal, turned walking into running and he lost a total of 70 lbs and went down four pant sizes! The best? He was able to get off his medication! For me, I have been overweight since my teenage years. I tried everything – going to the gym, Weight Watchers, Medifast, etc. It worked while I was on it, but then the weight would slowly creep back up. Watching Dave, inspired me. Over three years ago, at the age of 47, I finally had enough. I joined my husband on our new lifelong health journey! I also joined My Fitness Pal, we joined a gym and with proper vitamins and supplements and healthy food choices, I lost a total of 95 lbs and went down six pant sizes!! Sure, it was a lot of determination and will power and sticking to watching what I ate and working out, but I did it! You can email me at christine@4pathstowellness.com. Very nice I was looking for more ways to make money from home and looked up old company. Ran into you guys all that you shared is right up my alley. Love this. Hi James, thank you for your kind comment. I don’t remember having any knee problems when I first started. I started out walking and then gradually moved to running. For someone having knee pain I would recommend starting out with exercises like swimming and / or cycling as both exercises don’t involve putting your full weight on your knees. They are also great calorie burning exercises and will help with weight loss. I’m going to email you a more complete response. But thank you for your kind comment.